It seems that Sony is finally hopping aboard the streaming train when it comes to delivering content announcements to fans! 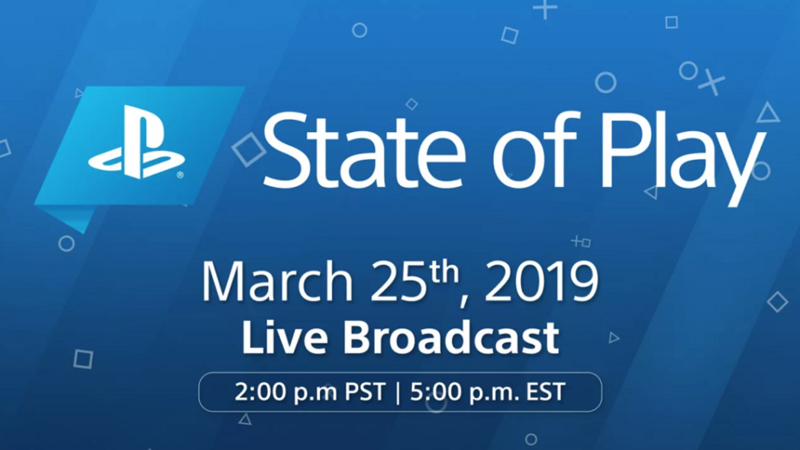 Much like a Nintendo Direct of Inside Xbox, Sony will use its new show titled State of Play to bring all new game announcements and information to PlayStation fans around the world. The first episode of State of Play will air this Monday, March 25 at 2:00 PM PST/5:00 PM EST. As far as content viewers can expect from the show, not much info has been given. As noted on the official PlayStation Blog, State of Play will “showcase upcoming PS4 and PS VR software, including new trailers, new game announcements and new gameplay footage.” No specific games are mentioned so it is unclear what exactly we will be seeing. We do know there will at least be a few new games on display for fans to get excited for in 2019! According to Sony, State of Play will be an ongoing series that will last at least to the end of 2019. It is not yet known if State of Play will be Sony’s replacement plan for skipping out on E3 this year or if some other event will take place around that time. Either way its good to see Sony taking the initiative to communicate to fans more directly who can’t wait to hear more! Will you be tuning into State of Play this Monday? Share your thoughts on the event below!